The 5:30 a.m. training continued with combat grappling, going to the ground and also adding on anti-grappling tactics. This is my client’s ninth hour in a 10-hour course on Basic Self-Protection. 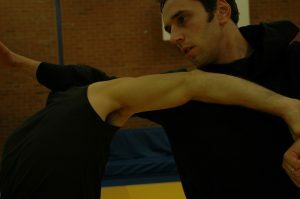 We began with revision on headlocks, initial head-lock escapes, back position, rear naked chokes and head-lock takedowns. Then we moved onto the cross-buttocks throw and striking from grappling holds. We went into some more detail regarding escaping the side head-lock. Here we focused on a deeper head-lock and how to break the hold, apply the eye-gouge and straight hand striking. Moving onto the ground, we covered the scarf-hold, striking from this position and safely transitioning to the knee-pin. This then brought us onto fighting from the guard and defending against the mount position. We returned everything back to regaining a standing position and going back to the default striking.